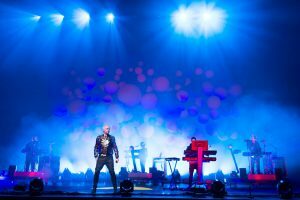 Taking the Pet Shop Boys’ Electric album on a world tour, sound engineers, Holger Schwark (FOH), and Seamus Fenton (monitors) have joined a growing number of acts that are keeping the audio in the digital domain. To achieve this, both engineers are using DiGiCo SD10-24 consoles, with two Optocore DD4ME Madi converters in the compact FOH side rack and a third at the monitor desk. The tour’s largest shows so far – at the London O2 Arena and MEN Arena – also made pioneering use of Nexo’s STM loudspeaker system. The multitrack playback that contains an essential part of Pet Shop Boys’ music, originates in a redundant pair of Madi-equipped computers near the monitor desk, combined using a DirectOut EXBox.BLDS switchover unit, which feeds the other DD4ME input on stage. The first output of that DD4ME goes into the monitor desk, carrying the multitrack playback and also comms mics and some effects from FOH, with the second output for recording. The DD4ME was designed to offer digital I/O compatibility with a range of devices, such as digital consoles with coaxial BNC Madi I/Os, and the large number of channels exchanged by a single DD4ME makes it a highly cost-effective interface, with two Madi input and two Madi output ports allowing the transmission of up to 128 input and 128 output digital audio channels per device. Seamus Fenton (monitors)At the FOH end of the two fibre cables, fitted with standard expanded beam connectors, the two DD4ME devices have a total of four Madi ports – two connected to the Madi ports of the FOH desk, offering a theoretical maximum of 112 channels each way between the console and the Optocore network. The third DD4ME Madi I/O is taken by a Mac Mini with DiGiCo’s UB Madi interface for system alignment tools, analysers, live plug-in processing and recording for virtual soundchecks, while the final Madi I/O connects to a TC6000 reverb, with a DirectOut EXBox.AES converter in line. ‘Optocore is our entire backbone,’ Schwark says ‘It allows me to patch everything through the network. I connect both of the consoles’ ports to the network, as well as my peripherals, and can now use the desk’s built-in tricks for virtual soundchecks for, say, 40 recorded channels, while still connecting to my reverb engines and analyser software on the higher-numbered channels. It works beautifully well and makes best use of the existing I/O on the back of the desk, without adding a bulky local I/O rack. Three-wide Nexo STM set-upFor both the O2 Arena and MEN Arena, Capital configured an LR system in a ‘double bass’ configuration using its new Nexo STM system. Each array comprised a hang of 15 STM M46 main cabinets in the centre, with two hangs of 15 STM B112 bass units, one on each side of the mains – the first use of a three-wide set-up. The out fill arrays covering the sides of the arenas used 15 M46 main cabinets per side. There was also a flown line of nine STM S118 subs per side, and nine S118s ground-stacked per side. ‘I had to think about whether I was happy to use such a new system on a big gig like this, so we had a small version of it with three tops, basses and subs per side to play with in rehearsals, and I got a good idea of the tonality of the system and how it behaves,’ Schwark reports. ‘The sound it produces is very clear, and I like the clarity of the top end. In the Arena, it covers well, right up to the last rows. ‘Capital Sound has been involved with the STM project from day one and it’s very rewarding to be able to introduce the system to our clients and for it to be so well received,’ says Ian Colville, Capital Sound Technical Manager. ‘These two shows are the largest that we have undertaken with STM, and I think that the speed with which the system can be rigged and de-rigged was particularly impressive. Including the fans, for whom the band delivered a dynamic set of synth-driven ‘80s hits, leading up a finale that included ‘Always On My Mind’ and ‘West End Girls’.